The female descendants of Robin Hood and his Merry Men, follow in their elders footsteps to stop injustice in Nottingham. When Robina, Little Jane, Flo Tuck and Winnie Scarlet see the Deputy Sheriff, Alan Dale, and his men evicting people from their homes, they stand against him. Alan says he will return in a few days with a proper warrant from his Sheriff Uncle, for eviction. 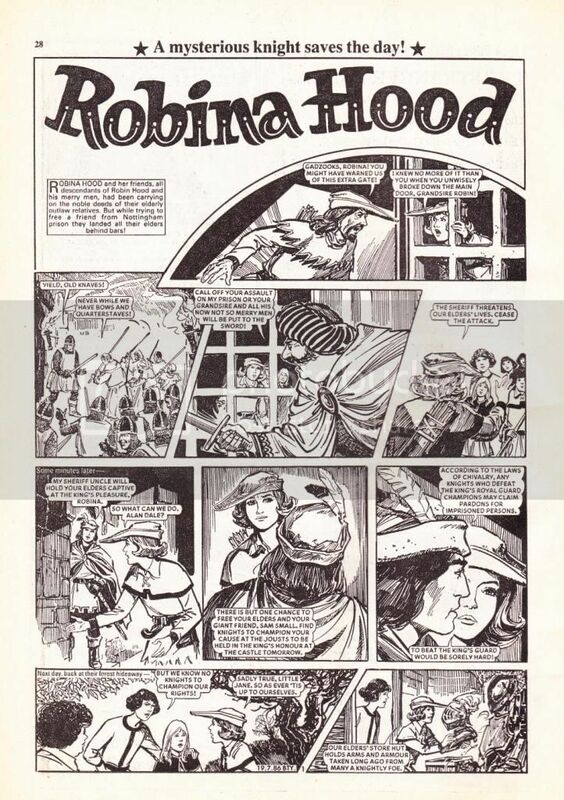 Robina goes to her grandsire Robin Hood to take arms against the Sheriff, but he tells her he is too old to fight but he agrees to train the girls. When Alan returns, Robina snatches the warrant from him and the girls force his men back. Alan swears she will regret this day. The Merry Maids continue their work helping those in need and punishing the greedy. They seek advice from their elders at times, but sometimes this does not work out. Like when Robin Hood advises them to take a key piece from a dam to restore a dry village, they end up flooding the village. Luckily Robina figures the flood will have drained the Baron Crookleg’s moat, so they are able to cross and raid the Baron’s castle. They then steal tax money to help the flooded village. Alan Dale and his Uncle try to be craftier than the girls, securing an armoured wagon to collect taxes in. The girls set up a trap for them but when it looks like they will evade it, they improvise by clattering pans on the armour causing such ringing inside that the guards give up the money. Another adventure sees Alan Dale helping the girls. When the Sheriff’s men decide to check if Master Mervin, an old alchemist, practices magic by tossing him in the river to see if he floats or sinks, the girls confront the men. When Alan Dale comes across them he says he had no part in this and that he knows Mervin is harmless. Mervin is to be taken to Nottingham prison over night and Alan tells the girls he will keep the streets free of guards that night if they wish to save him. They do save him with help of explosives they learn to make from Mervin’s “magic” book. Alan helps them again to save their elders homes from a forest fire. He also begins to give them inside information, such as his Uncles plan to trap them. Winnie thinks he has a soft spot in his heart for Robina. When they try to rescue a friend from Nottingham prison they accidentally land their elders behind bars. The girls are forced to stop their attack on the castle. Alan advises Robina that in order to free Robin, the Merry Men and their friend Sam Small, she must find knights to champion their cause at the jousts held at the castle the next day. According to the laws of chivalry, any knight that defeats the King’s champions can ask for prisoners to be pardoned. Having no knights to ask, the girls dress themselves in old armour they find and enter. They compete in a merry free for all but although they put up a good fight, the old armour they use is rusting, too big for them and the weapons are falling apart. Just when it looks like they will be defeated, another Knight dressed in black comes to their aid. After they win the knight reveals himself to be Alan Dale. Robina is impressed by his gallantry and skill. He says his courage came from the wish to be her knight. The elders and Sam are pardoned from prison and Alan joins the outlaw band. This isn’t the first Robin Hood themed story to appear in Bunty. Previously “Maid Marion” followed Marion leading the Merry Men, while Robin is away. In some ways that actually seems more progressive than this story, a woman leading a team of men. Here Robina and her team are a bit more of a novelty, as female equivalents to the Merry Men. Rather than having any major developments, they can be summed up with a few characteristics, i.e Flo is heavy and loves food. Also “Robina” as a name reminds me more of a drink’s name than an actual name! Still the girls are shown to be smart, brave, fighters and honourable. So they are good role models. I also like that they are descendants of the original Merry Men and that they still ask their elders advice. Although it seems Robin Hood and his men are now more bumbling in their old age often played for comic relief. I do wonder where Maid Marian is, maybe writer/editor thought having an older female role model would take away from the girls achievements? The art is gorgeous throughout, there is so much detail, in the backgrounds, costumes and expressions. The action flows well, the movement seems fluid. The girls look great and I am particularly impressed by the aged Merry Men. The story may leave some questions such as; where is Maid Marian and the girl’s parents? But overall it is a fun, action and adventure story, with a bit of romance thrown in as well. June also ran a story called Robina Hood. This is the pseudonym a girl adopts in her fight against a greedy developer. No Merry Men or Maids, just her boyfriend as her assistant. I’m not sure the artist is Geoff Jones. He has a quite distinctive style I find quite recognisable and I’m fairly sure this isn’t his work. The artist could be Rodney Sutton.